← Today's Google Doodle features hominid evolution! In recent years, robots are becoming more accessible and almost an integral part of our lives. They are not seen as only industrial machines which are used for welding and assembling vehicle components anymore. Many robots can now be used at home for domestic tasks (vacuums, pool cleaners, lawn mowers), for personal assistance (companion robots), or just as toys for recreational activities (small flying drones). Moreover, medical facilities are now equipped with modern robotic devices for tele-operated surgical processes as well as wearable robotic suits for human rehabilitation exercises. Since humans are interacting more closely with robots we should ask ourselves: How should we design robots that offer safety to humans and that are able to work in unpredictable environments? The Disney’s Marvel-inspired “Big Hero 6” movie has a charismatic robot with irresistibly cute personality which address the aforementioned issues. In this plot, Baymax (Figure 1) is an inflatable health care robot companion created by a brilliant robotics student, Tadashi Hamada. His soft form provides him the ability to deform when moving across unstructured environments as well as to absorb the energy generated from any collision. Because of its compressible structure, he is able to safely interact with humans at any level. These unique characteristics are based in a novel approach to robotics defined as “soft robotics.” As one of its goal, soft robotics seeks the creation of machines that are more adaptable and animal-like in their capabilities. Biological systems are largely comprised of soft materials . In animals, compliant materials are fundamental for the mechanical design of their body, which has coevolved during many generations with their nervous system and formed a completely integrated neuromechanical system. In changeable and complex environments, animals can use these soft components to their advantage. The body softness enables surface conformation, stress distribution and reduction of impact force, as well as entrance into very small apertures for shelter or hunting. 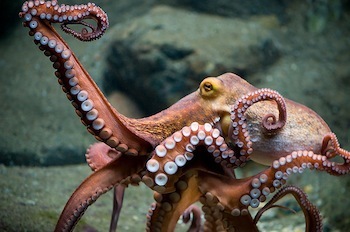 For instance, an octopus (Figure 2) can be seen as a biological demonstration of how effective behavior in nature is directly connected to the morphology of the body. Since it is a soft invertebrate, it can adapt the shape of its body to the environment, squeezing through gaps smaller than its unconstrained body. Furthermore, it can extend its arms very quickly to reach, grasp and manipulate objects. Its arm articulates the shape by shortening, elongation, bending, or torsion, and forces can be distributed by localized or global stiffening . of compliant structures in nature are essential for building soft robotic systems. Figure 3. Octopus-like soft robotic manipulator. Source: Laschi, Cecilia, et al. “Soft robot arm inspired by the octopus.” Advanced Robotics 26.7 (2012): 709-727. Soft robotics literature is flourishing and becoming vaster every day . The development of soft muscle-like actuation technologies is one of the major challenges in the fabrication of fully soft-body robots. As shown in Figure 3, an interesting bio-inspired soft robotic manipulator is based on the anatomy and mechanics of octopus arm . The exterior part of the soft robotic arm is comprised of a plastic fiber braid, whereas shape-memory alloy (SMA) springs are disposed longitudinally and transversally, as in muscular hydrostats. These metal alloys are capable of undergoing a certain strain and subsequently recover their original shape when heated, generating local deformations in the soft robotic arm. Mimicking soft animals requires investigating the most suitable technological solutions, such as materials, sensors, actuators and control schemes. With bendable and adaptable machines, we would be able to deploy robots in harsh and unpredictable environments or disaster situations. In the future, these soft machines could also play a role in space exploration. A group of researchers have recently proposed a concept of a soft robotic eel with electrodynamic power scavenging designed to explore the seas of Europa, a Jupiter moon . By studying how animals use soft materials to execute complex motions as well as perform everyday tasks in unpredictable environments, we can achieve helpful insights for designing new technologies for robotic applications in human assistance, search and rescue, environmental monitoring and medicine. The natural world can show the potential capabilities of soft robots. Many advances in soft robotics will be realized from the collaboration among several disciplines such as mechanical, electrical, materials science, bioengineering and computational evolution. Trivedi, Deepak, et al. “Soft robotics: Biological inspiration, state of the art, and future research.” Applied Bionics and Biomechanics 5.3 (2008): 99-117. Kim, Sangbae, Cecilia Laschi, and Barry Trimmer. “Soft robotics: a bioinspired evolution in robotics.” Trends in biotechnology 31.5 (2013): 287-294. Rus, Daniela, and Michael T. Tolley. “Design, fabrication and control of soft robots.” Nature 521.7553 (2015): 467-475. Laschi, Cecilia, et al. “Soft robot arm inspired by the octopus.” Advanced Robotics 26.7 (2012): 709-727. For more information about Thassyo’s work, you can contact him at thassyo at ieee dot org. This entry was posted in BEACON Researchers at Work and tagged BEACON Researchers at Work, Evolutionary Applications, evolutionary robotics, soft robotics. Bookmark the permalink.